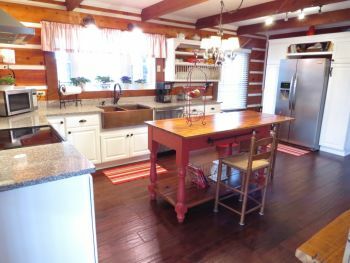 A4230 – 325 Pinetop Rd., Columbia, KY– If you’re looking for a beautiful and well-maintained home and property, this is the one! Property features approx. 105 acres m/l, ideal for cattle and/or horses, being totally fenced pasture land with 2 ponds, springs, and a large hay bottom fronting on Sulphur Creek. 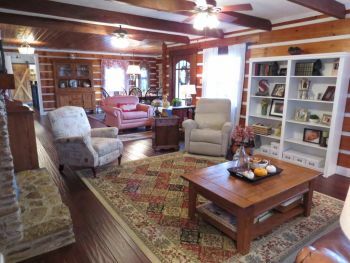 Property features a multitude of well-maintained improvements including a custom-built Jim Barna log home with large master suite addition! 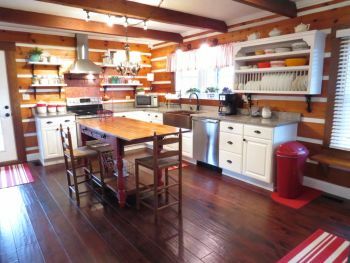 House offers 2 or 3 bedrooms, 3 full baths, living room with fireplace, large remodeled kitchen with copper sink – all stainless appliances – custom bar, main level utility area with built-in organizers, coat rack & laundry sink! You will love the large master suite with exposed hand-hewn beams – wormy chestnut rustic barn doors – large walk-in closet – master bath with tiled shower – double vanity – clawfoot tub – chandelier & more! The full basement is totally finished and has walk out entrance plus family room, extra utility room, the 3rdbedroom and bathroom – with all main rooms in basement having windows. Home has a multitude of covered porches and decks, plus covered gazebo! Also on property is a large 40 ft. X 70 ft. multi-purpose barn with 4 horse stalls – woodworking shop – tack room – storage area, also a 2 stall horse barn with loafing shed, another multi-purpose garage/shed building, and a heavy-duty metal panel corral with watering trough and feed bin. Property has approx. 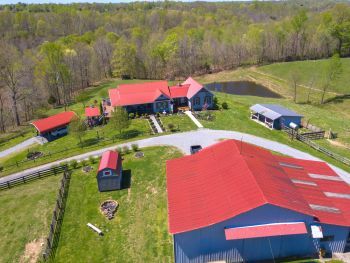 20 acres m/l in woods and is privately located at the end of a county road offering a wonderful country atmosphere.